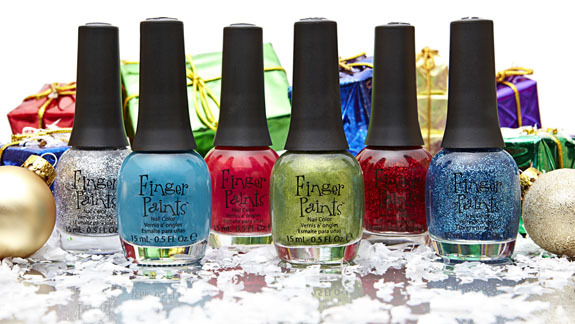 FingerPaints holiday 2011 collection is called Merry & Bright and will be available starting November for $4.99 each. I don’t know about you but I’m especially excited to see Comet’s Collar and Winter Blue! These were already out last week at my Sally’s. I have to say they werent that exciting, they looked like some they have already done and they werent very Chirstmas-y to me so, I didnt get any. These look really nice. I don’t own any of this brand. These are pretty, but I’ve seen most of these colors before. I’m looking forward to seeing swatches of that green… it’s got potential! And the blue glitter might be fab if it’s in a good tinted base. Santa Kisses, Comet’s Collar, and Drummer Boy look like the only ones worth looking at. Santa Kisses looks like it has some gold glitter, too, and I love blue glitters. Comet’s Collar reminds me of CG’s Peace on Earth but I don’t know..
I’m interested in seeing the green in person. Oftentimes, polishes look better in person than in promo pictures. I love that this collection as a whole reflects a lot of where holiday home decor has trended the past few years–brighter, happier colors! Can’t wait to see these swatches.